After a long day, a relaxing soak in a freestanding bath is sure to sound appealing. But how do you create the boutique hotel-style bath set up of dreams in your own home? The good news is it isn't as hard or pricey as you might think. And, if you are in the process of designing a bathroom, creating a stunning focal point with a freestanding bath is the way to go. Even if you bathroom is a little on the small side, there will be a bath for you. With a striking polished finish, a double-ended, cast iron bath makes an elegant addition to a contemporary bathroom. We love the roll top design of this Tamar bath from Drummonds – a comfortable spot for unwinding after a long day. Adding a modern twist to a classic slipper style bath, a brightly coloured finish is a great option if you're keen to add colour to a monochrome scheme, or draw out the more subtle tones of a beautiful botanical wallpaper. With a lick of pretty pink paint, the Devon Freestanding Slipper Bath from Heritage Bathrooms makes a cheery addition to any bathroom. If your style is sleek and minimalist with an industrial inspired feel, a freestanding bath with a matt black finish makes a wonderful addition. We love the unique feel of this space; with a monochrome wall mural and freestanding bath creating a striking focal point that draws the eye and makes the small bathroom feel longer and more spacious. For more tips on designing a small bathroom, have a read through our guide. This happiness-inducing, freestanding bath is effective in drawing out the cheery yellow tones of the floral wallpaper. If you're worried about the longevity of investing in a brightly coloured bath, remember that specialist bathroom paint will allow you to change the scheme when it suits. Find a similar bath at Drummonds. Copper tones are will add depth and warmth to a minimalist space, or enhance the look of a traditional design. The Tay Bath from Drummonds is designed with an elegant, rippling plinth. Take a look at our design gallery of traditional rolltop baths if you'd like a more authentic look for your period home. Using an on-trend bathroom paint colour is a stylish idea for updating a contemporary bathroom, with colour blocking proving a great option for a space with a freestanding bath. Simply paint up to the height of a bath rim in one shade and choose another for the space up to the ceiling. Keep shades neutral for an industrial inspired feel. Add depth to the space with the addition of a mounted wall light – we love this Box Wall Light from Original BTC. For more bathroom paint ideas check out our inspiring gallery. A wonderful alternative to more classic-shaped models, the simple silhouettes of modern freestanding baths make sleek additions to your space. Positioned in the centre of a room (if space allows), they are effective in creating a striking focal point. Find more contemporary bathroom design ideas. A freestanding bath in a dark grey tone makes an understated, fitting addition to a bathroom with a light or grey colour scheme. Style with aged wooden herringbone flooring for an on-trend, industrial inspired feel. The combination of this Nikki Black Freestanding Acrylic Bath, available at Drench, with a white marble feature wall makes for a stylish and contemporary feeling space. 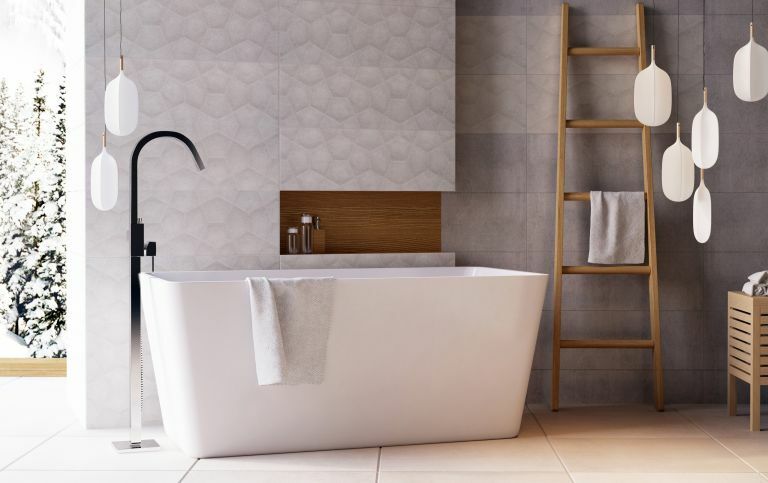 If you already have a striking focal point within your space – a wood effect wall or patterned wallpaper are good examples – consider opting for a freestanding bath with a simple design to avoid overwhelming the space. Find this Duchess Freestanding Bath at B&Q. If you like the idea of using your freestanding bath to create a focal point, consider pairing it with a curated gallery wall. Start by reading our guide to displaying pictures and photos before grouping an eclectic mix of mirrors, images and frames together for a unique feel. Combining a traditional (or traditional-inspired) freestanding bath with more contemporary design features, an on-trend patterned tiles, for example, is a lovely option for a period property with modern interiors. Check our more stunning patterned floor tile ideas in our gallery. We love the combination of this Belle de Louvain Rembrant Tin Bath, available at Victoria Plumb, with grey toned contemporary floor tiles. Just because you have a small bathroom, it doesn't mean a freestanding bath is off limits. While you will have to compromise on size, a smaller model has the same impact as a design feature. Find a similar freestanding bath at Victoria Plum. If you're working with an awkwardly-shaped bathroom, consider experimenting with the positioning of your freestanding bath. While, on a practical level, this may not maximise space, it's a great option if you like the idea of a bathroom with a unique design. Choosing a floorstanding tap not only looks striking but means you can lie however you like without leaning on a very hot water outlet. This design also offers greater flexibility for bath placement as you don't need to put the bath against a wall for the water source. If you do not have room under the floor for pipework, build a raised platform to neatly conceal it. That is the secret to those eye-catching baths you see in the middle of boutique hotel rooms! Find out more about choosing taps for your baths and basins. Looking for more bathroom inspiration?